I have a free packing checklist template for all my email subscribers. Details are at the end of this post. A QUICK RECAP: For new readers. In 2010 my family and I set out on an adventure to travel long term with the kids while also working on personal and family goals. But… travelling long term costs money, so one of my many goals I wanted to accomplish was to create a portable income that I could do from anywhere in the world. Every few months, I share my entrepreneurial journey and personal update in a progress report. Today’s post is one of those reports. If you’re interested in doing what we’re doing you should follow along . First An Update: What we’ve been up to. It’s been almost a year since my family and I moved to France for our family sabbatical. (we arrived the 5th of October 2011). 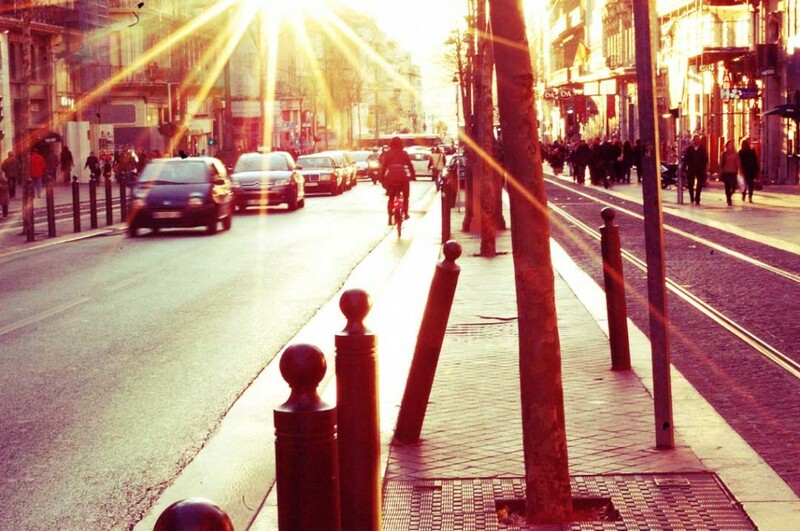 We spent 10 months in Marseille France but quickly realized that although having the amenities of the city was good, it wasn’t the life we thought we were going to have. We realized we would rather give up some of the big city amenities to live in a smaller, quainter town and more typical French Town. You know….the kind of city you imagine or see in the movies. Where little old ladies carry wicker baskets around full of baguettes while walking their miniature dogs and men wear French Berets. We searched for our new dream city in the south of France and found lot’s of nice places but we had some restrictions which limited our choices. It was important for us to stay near the water and where it is warm. Hence the South which is bordered by the Mediterranean sea. We needed a place that was fully furnished and within our budget. (i.e. less than 1,200 Euros per month). It could be a small town but it had to at least have a train station that could access the rest of Europe and have a bus system we could use to get around in the town. Lastly, it had to be a good place to raise children. Marseille was fun for a while but I would not want to raise my kids there. Now we can say we lived there but it was time to move on. We found a small town that surpassed our expectations. 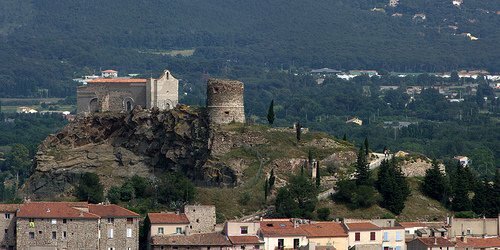 The city is called “La Garde”. We moved to La Garde on September 1st 2012 and plan on staying another year. Here’s a video about La Garde. Check out the Arial views. The kids all love it here and so do Blake and I. In less than a month, the kids are already fully integrated in public school. (It was really hard getting all that arranged). Our 16 year old joined a soccer team which is called “LE Foot”. Our 14 year old is doing judo 3 times a week. And our youngest who is five is taking dance and ballet one a week. Get this. It only costs 150 euros for each of my children’s sports for the ENTIRE YEAR. That’s a steal compared to what we’re used to paying. Back in California, it would have cost a hundred bucks a month for each of the kids activities at minimum. Did I mention that preschool is completely free . Again, back in California it costs over 1,200 dollars PER MONTH to put a child in preschool. The cost saving in preschool and yearly sports alone is over 15,000 US dollars which means we don’t’ need to make as much money. The quality of life here is just amazing. We live in the center of town in what is best described as the medieval part of the city. Our flat was built in the 1500’s and walking down our street you really feel like your in a renaissance fair. Cobblestone road, tiny road with lavender hanging from peoples windows. Directly above our flat is what looks like an old castle but is really an old church. You can see it in the photo above. I even love the official crest or logo of the town. How cool is that? The town we live in has an official crest. So cute. What can I say? It’s everything we wanted and expected in a small French town. I will fill you in at a later date with the details, photos and video. La Garde isn’t that far from Marseille. 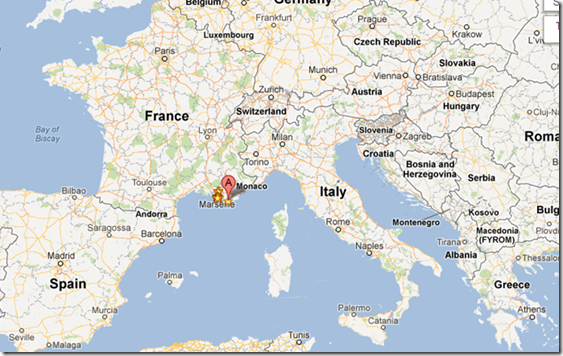 It’s only 73 KM or 43 Miles east of Marseille and just 100 miles west of the Italian Border. Bonus, we’re just 10 minutes to the beach. Enough about the city for the moment. Let’s talk about business. I’m excited to announce that I have a FREE GIFT for all my email subscribers. It’s a downloadable Gift and it’s super useful. I noticed that a lot of solo-preneurs that have a web presence, (like me) give away something to their readers if they sign up to their newsletter. Up until recently, I have offered nothing to people who sign up to my newsletter. Not because I didn’t want to give them something. I just had no idea what to give away. I didn’t just want to give away some fluffy piece that you could download and never read or look at. I wanted to give my readers something really useful and practical. Then one day it hit me. What’s the one thing that people have in common when it comes to travelling. I have tons of packing experience, so naturally, I finally connected the dots and thought I’ll create a free packing checklist template that people can print at home and use as a guide to help them end their hatred of packing. Introducing my gift to you, a free packing checklist template. I like to call it “The Ultimate Packing checklist template” because it has almost everything you would ever need to consider to take on a trip. I know, I know. 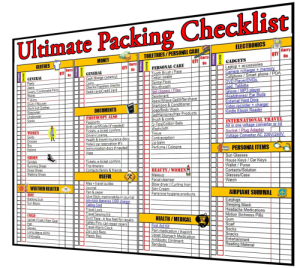 It seems really simple and there are tons of packing checklist templates out there but mine is a little different. Quantity Column: Mark the quantity you want to bring if needed. Completed Column: Then just start packing all the items on the list and check it off as you pack them. Carry On Luggage Column: The best part about the list is I have a column for carry on items. If an item needs to go in your carry on bag, you put a check mark in the Carry-on column. I can’t tell you how useful that one piece is. 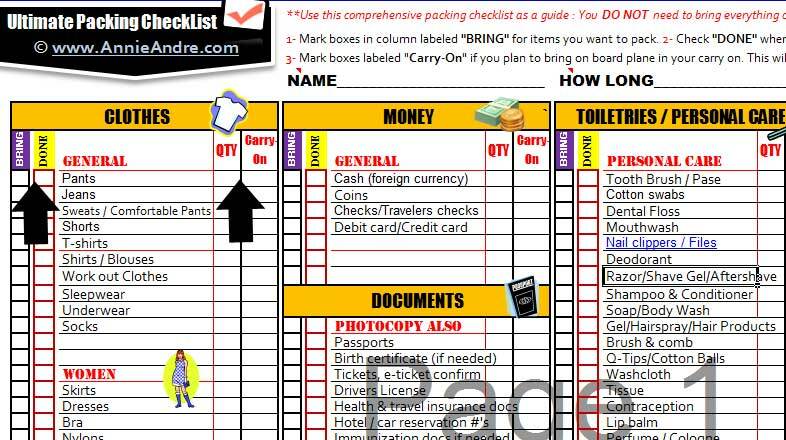 Here’s a closeup screenshot of the packing checklist template. For the moment, it’s a PDF doc and not editable but I may change that. Now when someone comes to my site they will see the sign up form on the right hand side along with the video below explaining the benefits of using a Travel and packing checklist. Please take a moment to watch the video and tell me what you think in the comments below. If you feel like signing up for my “Adventurous Newsletter, you’ll get instant access to it. That’s all folks. Happy packing.